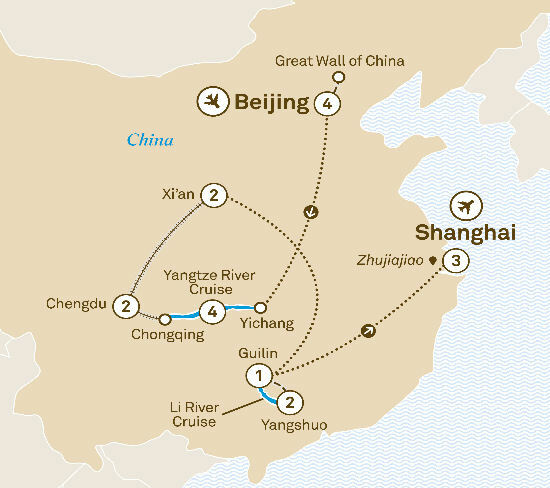 Start your tour with a special highlight as you visit China’s most iconic attraction, the Great Wall at Mutianyu. Wander through Tiananmen Square and enter the mysterious Forbidden City. Afterwards, enjoy lunch with a local family in a traditional home in the hutongs before relaxing on a rickshaw ride through the ancient laneways. Hunt for ingredients at the wet markets for a wonderful interactive cooking class. Alternatively, learn the ancient art of writing Chinese calligraphy or visit the incredible 15th century Temple of Heaven. Disembark and tour around Chongqing and the ancient town of Ciqikou, known for its porcelain. Experience China’s new high-speed train network on the way to Chengdu and settle in for a two night stay. A special day with an enchanting encounter with rare giant panda cubs. Gaze at Emperor Qin Shi Huang’s amazing Terracotta Warriors in the company of a museum curator, an incredible opportunity to learn first-hand about the restoration process. Later, enjoy a stroll around the Big Wild Goose Pagoda and Thanksgiving Temple. Be treated to a private after hours viewing of ancient artefacts at a local museum. Savour refreshing drinks and learn about the history of Shaanxi Province from the museum’s curator. Venture into the countryside to discover a rural way of life rarely encountered by tourists. Visit Fuli, the hometown of China’s iconic painted paper fans. You’ll even get to meet a master of the art and try your hand in creating your own souvenir. Visit the Shanghai Museum and People’s Square before exploring the French Concession and Xintiandi pedestrian dining and entertainment area. Alternatively, visit Zhujiajiao, a town with a rich canal life and a wealth of traditional buildings and bridges or cruise along Huangpu River. Later, spend your free time exploring Nanjing Road, with its wealth of shopping opportunities before enjoying your farewell dinner. From old timber houses on narrow cobbled streets to cormorant fishermen using their fascinating techniques, this itinerary is your opportunity to discover a China many modern travellers don’t get to witness first-hand. It’s the China beyond Beijing and Shanghai – a charming wonderland where ancient crafts are still applied in the time-honoured fashion. You’ll get to embrace natural wonders, from rivers that snake through beautiful rolling landscapes to striking limestone outcrops that evoke images of old oriental water colour paintings. There’s something both strange and familiar about the places you’ll visit, at once thrillingly new and comfortingly recognisable. That is part of their allure, and their wonder.